Our much-loved Luca Pom Knitting Kit is getting a lot of attention this winter, including features in The Guardian, The English Home, Psychologies mag as well as notonthehighstreet.com. It’s simple illustrations and step by step guide on how to start knitting is perfect for wannabe knitters. We gave our Luca Pom Hat a new friend - the Lola Pom Slippers! Available in our new summer colours, and requiring only one ball of yarn, these sock slippers are super quick to knit up. Then, kick back and relax! 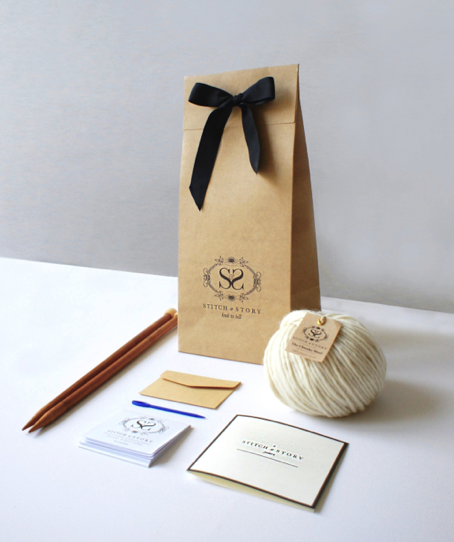 This kit contains everything you need to get started and learn the basic knitting techniques - what colour will you choose? Visit www.stitchandstory.com for more kit ideas. Available in our new summer colours, and requiring only one ball of yarn, these sock slippers are super quick to knit up. Then, kick back and relax!This kit contains everything you need to get started and learn the basic knitting techniques - what colour will you choose? Wool you be mine? 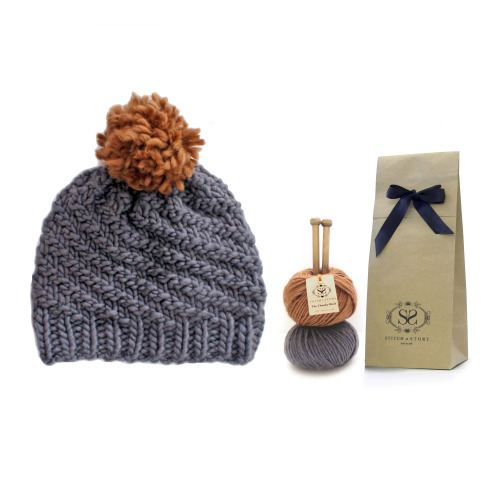 We’re feeling a bit generous as it’s getting closer to Valentine’s day and we have 2 Luca Pom Knit Kits to give away! Simply enter your details over at Let’s Get Crafting magazine who are sponsoring the campaign and you could be the lucky person! Enter here. You can also shop our entire range on our website: www.stitchandstory.com and for all orders placed this week, we will include a free personal message, S&S stamped and sealed! Simply enter your personal message on the checkout page. Shop now! Who’s Stitch and who’s Story in your duet? Our name doesn’t represent anyone but rather, an idea. Knitting is a way of embedding our creations with emotions and memories i.e. on all the careful time spent crafting; the cakes and coffee accompanied with curious minds; and the victory of finishing your hand-knitted item, quirks and all! We want every knitted project to be meaningful, whether it’s for gifting or for yourself – there’s just a great sense of achievement in having knitted an item yourself and that adds to the richness of stories behind handmade products and thus, every ‘stitch‘ knitted builds a ‘story‘…! 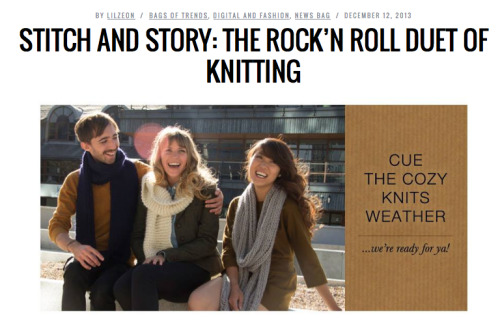 Knitting…how come it’s now fashionable? Like other recent boom in household crafts such as baking and sewing, the return to needles and yarn has been seen as a wider backlash against the superficiality of modern life. While manufactured goods can be functional, durable, beautiful, even inspiring, the very fact that they are mass-produced makes them disposable. In its uniqueness, a handmade item such as a knitted item carries the imprint of its creator. The very fact that you’ve made it means no one else will be wearing the same thing as you! Tis the season to be jolly…and learning a new craft! If you’re stuck on what to gift your loved ones this Xmas, why not choose something different such as a knitted scarf, hat, or jumper? Learn to knit with Stitch & Story with online video tutorials and knit kits. Which colour will you choose this Xmas?